Based on the political stakes of Kashmir, three wars have been fought over the disputed region, by India and Pakistan. Kashmir, which is viewed as a pandora box, has historic geo-strategic compulsions for both the countries, and in terms of its annexation, it would mean greater strategical depth, and total control of lifeline rivers. For India, especially, Kashmir acts as a wedge between the Sino-Pak nexus. When we talk of conflict resolution for Kashmir, it may be through a variety of actors, namely the states, international governmental organisations (IGO's), and international non governmental organisations (INGO's). They always form a bargaining process in a conflict resolution. In academics, there are four kinds of mediation to conflict resolution namely; humanitarian mediation: when there is intense ethnic violence mainly mediated by non state actors; protective mediation: undertaken by a neighbouring state actor by saving the kin from complete defeat; defence mediation: where kin is the adversary of the mediator, and where political settlement and economic cohesion in the society is necessary; pro-active mediation: where mediation is bilateral or extra-regional. In terms of academic theory and its solution to the Kashmir problem, there are models based on it available for the people to follow. Noted American writer, and expert on South Asian affairs, Selig S Harrison expressed the solution as spiting of the Indian state, where Ladakh and most of Jammu would be integrated with the Indian Union, and sizeable Muslim populations from Jammu and Ladakh and the valley of Kashmir would be integrated with a special status. The new State would then be given a far reaching autonomy ( as per the models in which Italy and Yugoslavia were involved). The present Line of Control (LOC) would then become an international border with Kashmiri people traveling freely between the two regions without any visas. Mr. BG Verghese's five core ideas on Kashmir's solution include: a soft state between India and Pakistan with an adjusted Line of Control (LOC), with an easy movement of commerce on both the ways of the border; each region of the Kashmir negotiating the levels of autonomy; federating regional autonomy; confederating both regions by both the countries; the fifth would result as an autonomous state of Jammu and Kashmir. In December 1998, a New York based group drafted the Livingston Proposal, which aimed to provide a solution among all three parties, where the main recommendation was reconstituting Kashmir into one or two entities without any international status. The research also involved culture, economy, and ecology into account. The proposals entitled Kashmiris of having either passports, having a separate currency, free transit of people and commerce. The paper had been circulated to diverse Kashmiri groups and several opinion makers and got positive implications. The other options conceived were the Dixon Plan, ascribed to Sir Owen Nixon of Australia, who submitted it to UN on September, 1950, where our fate has to be decided by a plebiscite. The Chenab Plan, a favourite among Pakistani diplomats, where six cities Srinagar, Baramulla, Budgam, Kupwara, Pulwama, Anantnag are to be granted sovereign status, and Hindu dominated regions will go with India. The LOC would then shift eastwards towards Poonch, Rajouri and Doda and will finally merge with Pakistan. There is the Andorra Model which advocates autonomy for both the regions, guarded by military of two regions, just like Andorra, where French and Spanish armies operate along its borders. There is also Deepak Basu's Plan of implementing two nation theory to its logical conclusion, by exchange of Muslim and non-Muslim populations, and Neelam Plan, which envisages shifting of Line of Control along the Neelam River, rendering Northern Areas of Gilgit and Baltistan as independent. Finally, there has been the Musharaf's 2004 proposal, which envisages demilitarisation from cluster groups namely the Hindu dominated (Jammu- Kathua -Samba -Udhampur), Muslim dominated (Doda- Poonch- Rajouri), third being the Muslim dominated Kashmir valley, fourth being Kargil-Drass, fifth being Ladakh, sixth being the POK areas; followed by a change in status, which are based on two nation theory, where he emphasis Kashmir being made a slave to Fourth Generation Warfare - where conflict shifts from destruction of military targets to socio-economic and politico-cultural targets. 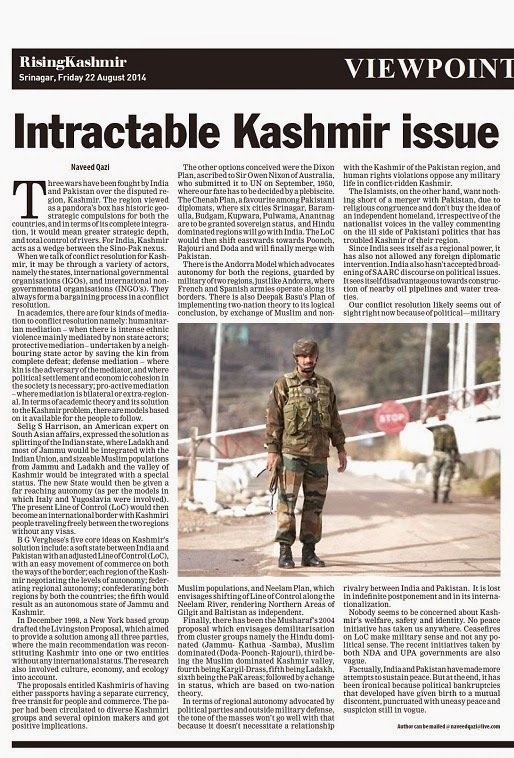 In terms of regional autonomy advocated by political parties and outside military defence, the tone of the masses wont go well with that because it doesn't necessitate a relationship with the Kashmir of the Pakistan region, and human rights violations oppose any military life in conflict ridden Kashmir. The Islamists, on the other hand, want nothing short of a merger with Pakistan, due to religious congruence, and don't buy the idea of an independent homeland, irrespective of the nationalist voices in the valley commenting on the ill side of Pakistani politics, that has troubled Kashmir of their region. Since India sees itself as a regional power, it has also not allowed any foreign diplomatic intervention. India also hasn't accepted broadening of SAARC discourse on political issues. It sees itself disadvantageous towards construction of nearby oil pipelines and water treaties. Our conflict resolution likely seems out of sight right now because of political - military rivalry between India and Pakistan. Its lost in indefinite postponement and in its internationalisation. Nobody seems to be concerned about Kashmir's welfare, safety and identity. No peace initiative has taken us anywhere. Ceasefires on LOC make military sense and no political sense. The recent initiatives taken by both NDA and UPA governments are vague. Factually, India and Pakistan have made more attempts to peace that the last four wars. But at the end, it has been very ironical because political bankruptcies that have been developed have given birth to a mutual discontent, which have been punctuated with uneasy peace and suspicion. which are still in vogue till date.